Moran and Pateman both spent years at the Emma Goldman Papers Project and have written on American anarchists, so if you wanted anyone to work on a book by Berkman, it would be these two. The footnotes give you as much helpful context as they can, without claiming no-one will ever find anything else to say, nor ‘telling readers what to think or how to interpret passages or events.’  As well as the footnotes, this edition contains the diary Berkman kept while writing Prison memoirs. It shows how hard it was to write, and also how he struggled after his release: ‘much of Berkman’s future life would be a struggle between who he was, or wanted to be, and what the Western State Penitentiary had done to him.’ [p2] The diary also lays bare his relationship with Rebecca (Becky) Edelsohn, which was non-exclusive, painful and complicated. This would also be invisible without their editorial work: Edelsohn appears only as ‘Alice’ and ‘Tess’ at the end of Prison Memoirs of an Anarchist [p437 and p448]. And that would be less visible if it wasn’t for the quality of John Barker’s indexing. I was struck by the importance of imagination in Prison Memoirs of an Anarchist. Prison is not what he expects it to be: ‘I thought I would be sitting on the floor in a gruesome, black hole, with my hands and feet chained to the wall; and the worms would crawl over me, and slowly devour my face and my eyes, and I so helpless, chained to the wall.’ [p110] Then he dreams of a magic ring that ‘dissolved the prison walls’ [p114]; and later imagines himself escaping as a letter: ‘all the while the real “me” is snugly lying here in the green box, peeping through the keyhole, on the watch for the postman.’ [p135] I don’t think this is just the inevitable response to the dullness of prison life. Perhaps imagination is central to his personal growth as well as his survival. Berkman never surrenders; he always sees himself as ‘an Anarchist in the hands of the enemy’ [p441]. Yet he doesn’t decide that victory will come if the anarchist movement is more fierce or more cunning. Berkman’s achievement is to know that it has to be more human – we need not only persistence but also ‘hearts that grow not cold’ [p373]. This edition of Prison Memoirs of an Anarchist is a must-read for anyone interested in anarchism or anarchist history. Beyond that, I think there might be some productive digging to be done on how the stories that we tell ourselves – or that we get told – affect our lives and our world. As Moran and Pateman say, after release Berkman would ‘make his own script.’ [p11] Not matter how long ago the opening of those prison doors seems, that makes Berkman’s struggles not just interesting but also inspiring. 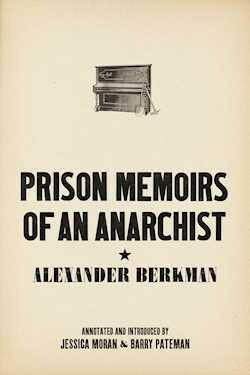 Prison Memoirs of an Anarchist by Alexander Berkman, annotated and introduced by Jessica Moran and Barry Pateman.